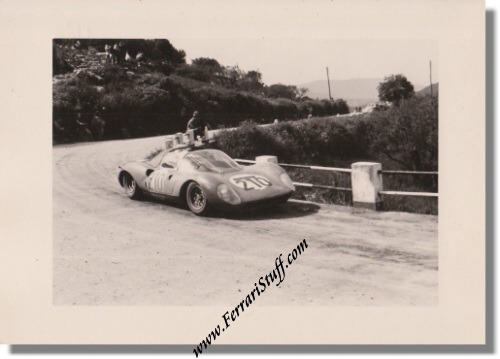 Vintage 1966 Photo of Ferrari Dino 206 P S/N 0842, Targa Florio. This is a vintage 1966 photo of the Dino 206P Spyder, S/N 0842, during the 1966 Targa Florio. The car was driven by Giampiero Biscaldi & Mario Casoni to a 14th spot overall. In 1967 Guenther Klass heavily crashed with this car and died of his injuries. The car was consequently scrapped. Originally, the car was a works prototype. The photo measures some 5 x 3.5 inches or 12.5 x 9 cm and is in excellent condition. The back carries NO photographer' stamp.